If you’re not from Omaha or you don’t live here then you may be surprised to learn this nondescript Midwesten city is the home to a sizable African American community with a rich history. 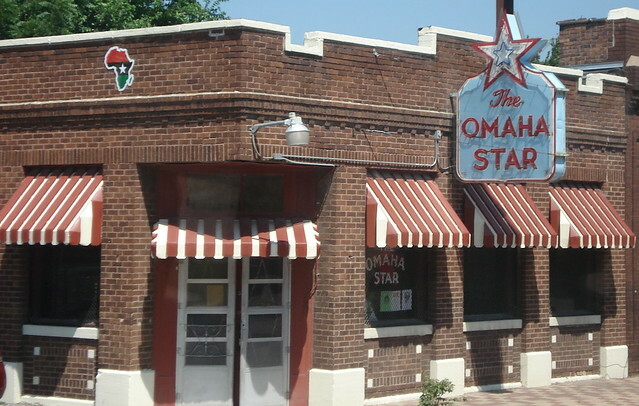 It may further surprise you to know that a significant figure in the American black press of the mid to late 20th century was a transplanted Omahan and a woman to boot, Mildren Brown, who founded, published and edited the Omaha Star, which became the leading and eventually only black owned and operated newspaper serving the community. As my story below for The Reader (www.thereader.com) reveals, Brown heavily influenced two black women who became media titans: Chicago Crusader publisher-editor Dorothy Leavell and Radio One chairperson Cathy Hughes. When Brown died in 1989 the paper passed onto to her niece Marguerita Washington, thus continuing the publication’s black woman legacy. NOTE: The story posted here is a longer version than the story that appears in The Reader. In this fluid transmedia age an old warhorse of a newspaper, the Omaha Star, celebrates 75 years of continuous publication at an April 19 Scholarship Banquet benefiting the Mildred D. Brown Memorial Study Center. The Star may not be known for exceptional reporting but it does own a groundbreaking gender and activist lineage. Its late publisher, Mildred Brown, was among very few women, white or black, to run a newspaper of its size and reach. She and her first husband co-launched the Star in 1938 though Brown was the real driving force behind it. Within a few years she divorced and from that point on served as sole publisher and editor until her death in 1989. A black woman at the head of a successful media enterprise inspired Chicago Crusader publisher-editor Dorothy Leavell, the featured speaker at the April gala, and Radio One chairperson Cathy Hughes. Though several years younger, Leavell’s career paralleled Brown’s when her first husband, Balm Leavell Jr., who founded the Crusader, died and she took over as a young single mother. She expanded the Crusader empire to reach hundreds of thousands of homes and businesses. 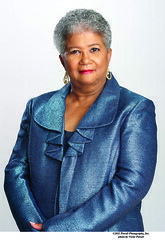 Leavell’s also served as president of the National Newspapers Publishers Association, a trade organization representing hundreds of African American newspapers, and chairperson of Amalgamated Publishers, a company thats sells national advertising to black papers. As a fledgling journalist Leavell pattered herself after the “strong black woman” she saw in Brown. She admired the way Brown handled herself amid their mostly male peer publisher colleagues. “She had a profound affect on me because…the men would try to discount you but they couldn’t discount Mildred. She was a strong personality, She would stand her ground. I always say, Mildred put the ‘n’ in nerve. Mildred was no-nonsense with those guys. The Alabama native and former educator migrated north with her then-husband, Shirl Edward Gilbert, a pharmacist. The couple started a newspaper, the Silent Messenger. in Sioux City, Iowa. In 1937 they were recruited to Omaha to work for the city’s then-black newspaper, The Guide, whose co-publisher, Charles Galloway, Brown remained friends with even after she quit to start the Star. The Star chronicled black people’s lives through the Depression, World War II, the Great Migration, the civil rights movement and America‘s changing face post-Vietnam and Watergate. When North 24th St. burned in outbreaks of civil disobedience this militant who didn’t believe in “breaking glass” called for both calm and redress. Upon her death her niece, former educator Marguerita Washington, assumed command of the Star and she’s still in charge today, giving the publication the distinction of being the nation’s longest running newspaper led exclusively by black women. Omaha native Cathy Hughes, who sold Star ads in the 1960s, appreciates the paper’s “black woman legacy.” Hughes built a media empire as a single woman. Her son Alfred C. Liggins III succeeded her as Radio One CEO but she wishes she also had a daughter to pass things onto. Hughes knew many sides of Brown. who was in her life from the time she was a little girl. Brown was a friend of her parents, William Alfred Woods and Helen Jones Woods. When her father graduated from Creighton University Brown let him office inside the Star. Drivers chauffeured her around in a big shiny sedan. “She had a good looking husband (Brown’s common-law second husband Max Brownell), she had a wardrobe, she had all the trappings of a media mogul. To me the Star was a conglomerate. She was NBC, ABC, and CBS combined in my mind,” says Hughes. Marguerita Washington marveled at her aunt’s drive. “She wouldn’t give up. She was very persistent. I went with her many times to a business place where she would be told the person in charge was not available. A lot of times the boss told their secretary, ‘Just tell her I’m not here.’ Of course, she knew he was, so she would say, ‘Well, I’ll wait on him,’ and she would sit there in the lobby until finally the guy would come out and say, ‘Oh, Mildred, what do you want?’ Nine chances out of 10 she got the sell. Hughes says Brown was proud of leading a newspaper that at the time of her death was half a century old and she imagines if Brown were alive today she would be thrilled it’s still going strong. The Star may not be the primary news source it once was for most readers but outside Revive! magazine it offers Omaha’s only black on black print perspective. It maintains a black press tradition emphasizing positive news, conveying black pride stories of individual accomplishments and informing readers of community events, as well as examining issues of inequity. Brooks says before today’s multimedia platforms the Star was Omaha’s only reliable media source for what was happening in the black community. In a documentary tribute to Brown the late Omaha musician Preston Love Sr. articulated what her paper meant to its readership. “She gave every little person on the street a shot at getting some recognition. Families were publicized for constructive things they did and successes. It’d have the picture of some young man or woman on the front page who’d got their master’s degree and that was important to people. Everybody likes publicity. If they tell you differently, they’re lying. Its interest in the whole gamut of African American life provided fairly comprehensive coverage of goings-on in the black community. “And because it goes back eight decades it is actually an historical repository because no one else was consistently capturing events and things taking place in the black community week after week,” notes Brooks. Now that the Star’s archives are being digitized a new resource will soon be accessible online to anyone researching people, places and events covered by the paper over much of its history. Today, the black owned and operated weekly remains a voice for a community not always well represented by traditional mainstream media. Subscriptions and advertisements are the lifeblood of any print publication and Brown scored ads like nobody else, sometimes using moral indignation to guilt whites into buying space. “Especially with a tough customer or potential customer she would try to appeal to his or her conscience,” says Washington. “She had a way of relating to business people to get them, sometimes with a little arm twisting, to advertise in her newspaper,” says Leavell. Getting people to do the right thing, whether buying ads in her paper or giving blacks equal opportunity, extended beyond the office. Brown was part of a coterie of black professionals, including Cathy Hughes’ parents, who shared similar aspirational-activist values and put them into practice. The DePorres Club’s founder, the later Rev. John Markoe, a Jesuit priest at Creighton University, was befriended by Brown after his civil rights work made him persona non grata at the school. She allowed the interracial club to meet at the Star. The paper often printed the minutes of the club’s meetings along with listings of its social action activities. As a girl Hughes joined her parents and Brown at demonstrations. She says her parents and Brown “imbued” her with the mandate “to improve the community” by standing up and speaking out for right. Brown’s Star promoted aspirational pursuits. She often included news about herself, such as meeting visiting dignitaries or receiving some award, because she enjoyed the attention and the affirmation it provided. Though some felt she didn’t go far enough, others felt she did all she could. “She was definitely considered a conservative by the Black Panther Party,” says Brooks, a one-time Panther member. He says she refrained from “the more radical hard push back approach” and instead focused on “collaboration and coalition.” Practical realities of the time constrained Brown from being too harsh in attacking racism. Dorothy Leavell leaves no doubt about Brown’s activism. Even near the end Brooks says Brown still “was totally hands on…totally in charge. Nothing went in that paper she didn’t sign off on. She was still much willing to say, ‘No, I don’t like that.’ Still very much focused on the political bent that she wanted the paper to be. She was like, ‘Yeah, I know it’s the 1980s now but this is what has worked, this is what the people want it to be, this is want the advertisers want to see.’ It was very much, If it ain’t broke, don’t fix it. That was very much I feel her attitude. Editorially, Brooks says he was given great freedom by her and is given even more by Washington, who’s serializing his new book about the state of black America. Outside of the late Charles B. Washington, who got his start in journalism under Brown, the Star’s not groomed any black journalists, though Washington says the Mildred B. Brown Memorial Study Center and its Junior Journalist Program is an attempt to do that. Margeuerita Washington says that because “it’s a different day” than when her aunt ran the paper she’s given space to more militant voices her aunt would not have accommodated, including former Omaha activist Matthew Stelly and Neb. state senator Ernie Chambers. The opinion pieces by Chambers can be particularly controversial and that’s why Brown shied away giving him a forum during her reign. Hughes says the Star has a vital role to play in the same way black magazines, radio stations, TV networks and websites do. “Next to the black church black-owned media is the most important institution in our community. I think too often African Americans have looked to mainstream media to tell our story. Well, all stories go through a filter process based on the news deliverers’ experience and perception and so often our representation has not been accurate. But the reality is we have to be responsible for the dissemination of our own information because that’s the only time we can be reasonably assured it’s going to be from the right perspective, that it’s going to be from the right experience, and for the right reasons. I think the black community just intuitively understands that. The clout and wealth Brown earned put her in position to help others and she did. Hughes says Brown also assisted young people getting their education. Washington says her aunt sponsored many college students. After her death a Creighton University journalism scholarship was established in her name. It goes to black students from Omaha area schools. “She literally walked the walk as well as talked the talk,” says Hughes. She holds out little hope someone will, in effect, endow the paper’s future operations. She intends continuing as publisher-editor for the forseeable future. “I’m in good health and I’ve still got some energy left.” A project she’d like to see happen is the renovation and expansion of the space-starved Star offices. Tickets to the April 19 Star gala at the Downtown Hilton, 1001 Cass St., may be ordered at 402-346-4041, ext. 4 or 6.